It is my goal to change that belief. Real men do eat quiche when it’s made to their preference! I like to make quiche that is hearty and filling and that appeal to the men in my life. Personal quiches are a great way to plan ahead for a busy week and have readymade breakfast for on the go mornings. The protein and vitamins in this recipe get your day off to a good start. This is also a good after school snack for hungry people! Preheat oven to 350 degrees Fahrenheit. Grease the cups of a muffin pan. Evenly divide the ham and broccoli between the twelve muffin cups. Using a coffee cup, break open one egg at a time and beat it with a fork. Pour the beaten egg into one of the muffin cups. Repeat until all twelve cups are full (one egg in each). Sprinkle the shredded cheese on top of the egg. Bake at 350 degrees for 25-20 minutes. Approximate Nutrition Information: Servings Per Recipe: 12, Amount Per Serving: Calories: 102, Fat: 7g, Cholesterol: 215mg, Sodium: 171g, Total Carbs: 1g, Protein: 7g. Make it a Meal: For a full breakfast, serve with toast and fresh fruit. For breakfast or snacks on the go, eat a quiche on your way to the car. Variations: Any combination of fillings can be used. Chopped sausage, diced chicken, pepperoni slices or even turkey are good meats to use as fillings. Any vegetables you have leftover will work as filling. If you use frozen vegetables, you don’t need to allow thawing before adding to recipe. These personal quiches work well as an appetizer also. 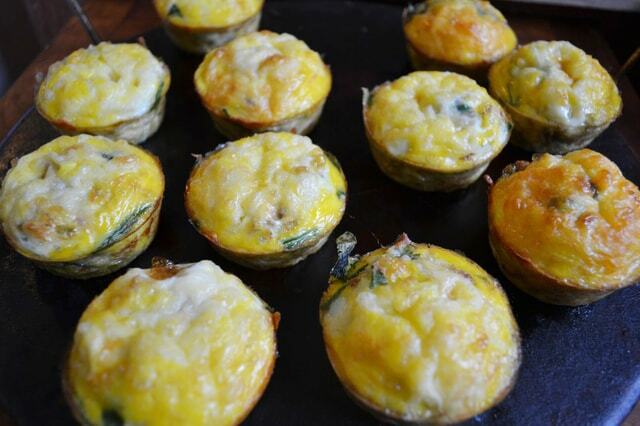 If you use a mini muffin tin, only add half to a third of an egg in each cup. Reader Feedback: BBC Salad has proven to be a reader favorite. Several readers commented they had clipped the recipe to save for future use with their garden broccoli bounty.